Tangled and True: sour cream lemon cake... the best ever. Preheat oven to 325. Generously butter and flour a 10 inch bundt pan. Into a bowl, sift together the flour, baking powder and salt; set aside. In a mixing bowl with hand-held electric mixer, cream 1 cup butter and granulated sugar; beat at high speed until mixture is very light and fluffy, about 5 minutes. Beat in eggs, one at a time, beating well after each addition and scraping down side of bowl frequently. Blend in lemon zest. Add flour mixture to the creamed mixture alternately with sour cream, adding each in 3 additions. Scrape sides of bowl frequently. Pour batter into prepared cake pan; bake in the preheated oven for 55 to 65 minutes, or until a cake tester or wooden pick inserted near the center of cake comes out clean. Cool in pan 10 minutes. Meanwhile, combine lemon glaze ingredients in a bowl, blending until smooth. Carefully turn cake out onto a platter; drizzle evenly with glaze. Serves 12 or more, depending on size of servings. i might have to try it. . .i seem to ruin every other lemon cake recipe i try! I cannot wait to make that.... very much up my alley. Thanks for sharing! Oh, I think this will be one of my recipes to try for my kid's birthday party this Saturday! I might have to try that . . . . thanks!! This recipe looks terrific. Thanks for sharing. Great blog, by the way! 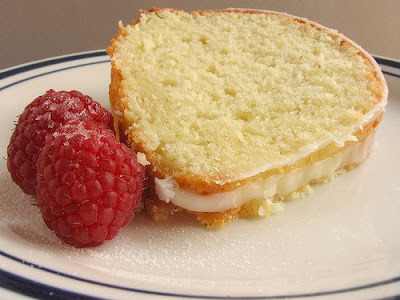 it is a good recipe to try...the cake tastes excellent and fluffy! TQ. The best lemon cake I have ever had by far. Even though the cake fell (I had some oven issues - long story! ), it was still fantastic and very moist. My friend Laurie made this cake for her show and I fell in love with this sweet summer cake. It was soo Delicious!! FANTASTIC recipe. Used cream cheese icing and a mountain of blueberries. Very happy friends/family! yummy batter - had to taste it to make sure :) - and it is in the oven. delish! moist, lemony (and i even forgot to put on the glaze) and addicting. i did add blueberries (the whole reason for making this was i saw a lemon blueberry cake on a menu and they were out of it and then of course i just HAD TO HAVE IT) and they were a great addition. Such an awesome cake! My husband and I finished it in a week's time. I makes a lot of glaze and I thought that it was too much so I threw it out, but later I realized I needed it to keep it from getting too dry ( I dd dry up only a little without all the glaze, but it was still so delish!). Thank you do so mush for posting this recipe, this will be one that I will pass on to my daughter when she is old enough to bake.